Hydrophobic Coatings Market size was over USD 1.5 billion in 2017 and industry expects consumption of above 15 kilo tons by 2024. Increasing preferences for waterproof Coatings in automobile along with technological novelties for implementing Nano-particles in hydrophobic Coatings due to their improved performance and high surface area should boost industry size. Push to reduce automotive vehicular wear and tear in an effort to minimize additional cost will drive product demand in anticipated timeline. Hydrophobic Coatings market size is anticipated to grow significantly owing to its ease when applied on textiles, wood, glass, metal, plastic, concrete and mineral undercoats. These products are dust repellent and resist corrosion, scratch and abrasion. Thus, can be used on all kinds of intricate geometries and surfaces, which is likely to propel product demand by 2024. Global medical device market size is anticipated to surpass USD 400 billion by 2024. Hydrophobic Coatings are nonchromogenic, biocompatible, abrasion resistant and lubricious. These products are used in medical instruments, surgical tools and devices to keep them clean for longer period as these tools becomes contaminated with tissue debris or fluids thus, driving product demand. Factors including wear resistance and appearance is likely to drive hydrophobic Coatings market size. Its unique features including UV resistance, low ice-adhesion, high strength and low wettability is likely to stir hydrophobic Coatings market growth over the forecast timeframe. Global optical lens market size is projected to exceed USD 6 billion by 2024 owing to growing usage in optical microscopy to be used for examination of blood cells and observing micro particles. Hydrophobic Coatings makes surface of lens to resist water particles, therefore, weakens surface bonding on water drop and surface of the lens which results in water drops to disappear from lens surface. Its anti-static property which keeps dirt and dust particles away from lens is likely to foster industry growth. Stringent environmental regulations by governing agencies including FDA and EU pertaining to the use of fluorochemicals are estimated to hamper industry growth owing to high toxicity levels of these products. High cost of these Coatings and its inability to endure rough climate & environmental pressure is likely to affect hydrophobic Coatings market price trend. Hydrophobic Coatings market size from polysiloxanes is anticipated to surpass USD 210 million in projected timeframe. These products are industrial maintenance and protective Coatings that have application characterized by chemicals, abrasion, high temperature and extreme UV. Its admirable aesthetic weathering characteristics in terms of gloss retention along with chalk resistance properties is anticipated to fuel product demand. Hydrophobic Coatings market size from titanium dioxide may observe strong gains at over 3% by 2024 due to its easy and quick application. Titanium dioxide can be added to surface of paints, tiles and cements to provide anti-fouling, sterilizing and deodorizing and properties. TiO2 has photocatalytic properties which creates hydroxyl free radicals in the presence of water which can change organic molecules to carbon dioxide and water and terminate microorganisms. These factors are likely to promote product demand in the forecast timeframe. Hydrophobic Coatings market size from automotive application is projected to surpass USD 2.25 billion in the forecasted timeline. These products can be applied to plastic, paint, metal and powder coat forming a permanent protective barrier in a vehicle. These Coatings react with substrate surfaces to form an abrasion resistant covering with very high bonding properties along with generating a high impact strength thin optically transparent Coatings with high flexibility and durability. These features of the product is likely to propel product demand in estimated timeline. 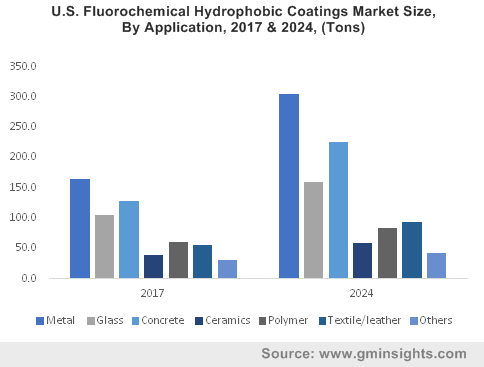 Hydrophobic Coatings market size from construction application may register gains at over 4.5% by 2024 owing to rapid growth in construction activities in Asia and Africa, which is likely to drive construction and building sector that may provide growth opportunity for hydrophobic market. The product provide an striking texture which resists dirt pick-up and only requires rainwater to remove dirt which does accumulate, thereby helping reduce external maintenance costs. Hydrophobic Coatings market size from glass substrate is poised to outdo 1.5 kilo tons in forecast timeframe. These products forms a influential bonds with glass materials to form a molecular layer to resist water from bonding. Treated surface instantly become anti-smudge and water-resistant, which are easy to clean. These Coatings repel dirt, water, oil and dust allowing for easy-clean glass, thereby stimulating product demand in the forecast timeline. Hydrophobic Coatings market size from concrete substrate is likely to witness gains of over 5.5% by 2024. Its application scope in building facades, functional terracotta, roof tiles and wall is likely to propel product demand in projected timeframe. Nano-Coatings forms an ultra-thin Coatings on inside of the pores and the substrates remain breathable after the Coatings which wash away contamination with the help of rainwater. Hydrophobic Coatings market size from anti-fouling property is poised to outdo 1.5 kilo tons in forecast timeframe. Aquatic sessile organisms simply adhere to inundated solids like metals, plastics and rocks but not to seaweeds and fishes, which are covered with soft and wet hydrogel. These product show excellent antifouling property in marine environment which is likely to stimulate product demand. Hydrophobic Coatings market size from anti corrosion property is set to surpass USD 1 billion in the projected timeframe. These can be used in pipelines, automobiles, and naval vessels and aircraft to solve metal corrosion problem which affects these systems operationally and economically, thereby stimulating product demand. 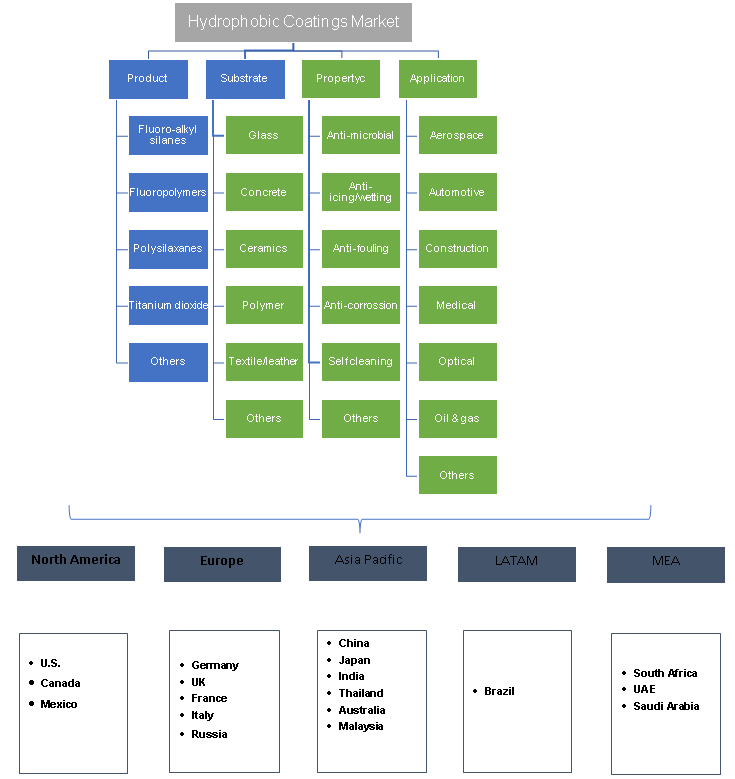 Asia Pacific led by, Australia, Japan, South Korea, India and China hydrophobic market size is projected to surpass USD 775 million by 2024 owing to strong application in automotive and construction industry. Rapidly rising disposable income has expanded demand for commercial and passenger vehicles leading to growing prospect for these Coatings. Introduction of new government initiatives and FDI has led to upsurge in automotive and OEM production due to mounting investments from international companies and firms. Europe driven by Italy, France, UK, and Germany hydrophobic market size may observe significant gains over 5% by 2024 owing to being manufacturing centers of key automobile players including Mercedes, BMW, Renault and Volkswagen. Vital local players are increasingly spending on their design and appearance of vehicle which is likely to stimulate product demand. These products are used on mirrors, windshields, windows and headlamps for improving visibility thus reducing accidents. Global hydrophobic Coatings market share is moderately fragmented with major industry players includes BASF, PPG, 3M, Drywired, Nippon Paint, NEI Corporation, Abrisa Technologies, Aculon, Advanced Industrial Coatings and Prelco. Companies are focused on developing novel & ground-breaking products to retain their consumer base and increase their market share. Manufacturer are investing profoundly on research & development to endure changing market dynamics. Hydrophobic Coatings is a nanoscopic surface layer which resists water. Water drops hitting on these Coatings can fully get reflected and form a shape of pancake or column. These products offer corrosion resistance, self-cleanability and improved moisture dirt retention along with prolonged life expectancy of substrate. Surface contact angle hydrophobic Coatings is key factor that determines hydrophobicity of surface. Contact angles greater than 90 degree can be attained by using hydrophobic agents surfaces or by fluctuating chemical composition of material.